Visibility to Your Data is Just The Tip of The Iceberg. Dive Deeper. View More. Risk Less. 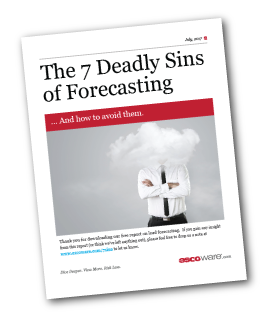 the Most Advanced Demand Forecasting System Built on Analytics & Intelligence Platform by ESCOWare. Weather is the most critical factor in determining customer usage. The ESCOWare® DFS solution utilizes proprietary, state of the art weather normalized algorithms that help to mitigate risk by accurately forecasting customer usage, allowing for predictable margins and profitability. ESCOWare® DFS is a cloud-based software solution designed specifically for the complexities of retail energy suppliers, and utilities. Utilizing both future start date and active contracts to determine total contractual load obligation, the Demand Forecasting System helps to maintain financial covenants and collateral requirements with wholesale counter parties. In addition, ESCOWare® DFS allows ‘what if’ scenarios to track and manage cash flow by testing extreme weather conditions and/ or the effect of customer growth (or churn) against the current book of business. 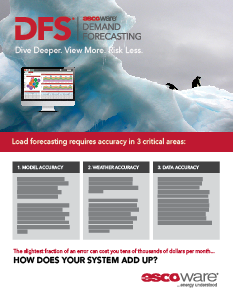 The Last Electric Load Forecasting Software You'll Ever Need. Below are some of the new Advanced Energy Analytics v3.0 features. Stay connected: All information about new product features, releases, updates on weather alerts and new reports are posted to our new bulletin board and are available for you as soon as you log into the system. Prevent important risk management duties from falling through the cracks. The tasks feature allows you to create, assign and manage important one-time and recurring activities for yourself and your team... All without ever leaving the DFS. 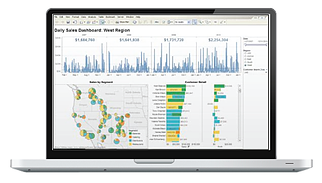 Significantly faster reporting engine allows you to see more data in less time. See your data in a variety of new visual formats that help you get to relevant data faster and make more informed risk management decisions. Be in control of your data. Manipulate and fashion your own unique reports through Ad Hoc Reporting - or save customized views with added filtering options through optional desktop application. Properly plan for growth by visualizing and analyzing the impact prospects can have on your energy portfolio forecasts and hedges. Forecast, hedge, and manage your position on a single customer or specific grouping of customers in your portfolio and gain insights through detailed drill-down reports. Effectively manage risk in real-time. Increase profitability by eliminating additional overhead. Lower server cost by using one centralized system. Make more timely, accurate decisions.